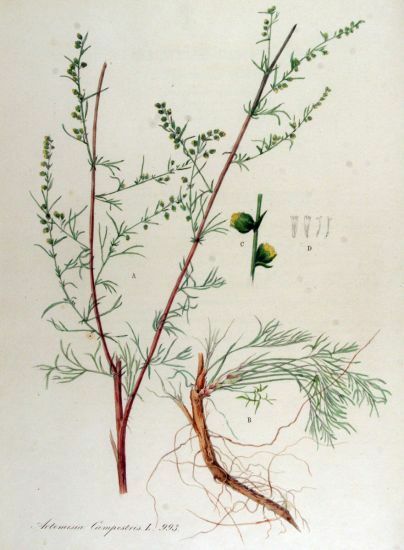 Artemisia campestris.Jan Kops et al. – Flora Batava – Permission granted to use under GFDL by Kurt Stueber. Source: www.biolib.de.luirig.altervista.org (Accessed 10/2016). Artemisia campestris is a biennial or perennial herb, 10 cm to 1 m tall from a taproot, scarcely aromatic, forming a leafy crown the first year, old inflorescences sometimes persisting with new growth. Leaves alternate, 2-4 times pinnate, 2-10 cm long, 1-4 cm wide, finely dissected, mostly hairless, segments alternate, linear to thread-like, mostly less than 0.2 cm wide, basal and lower leaves long-stalked, upper leaves of flowering stems with very short or no stalk, blades smaller, less divided. Flowers greenish yellow, very small, in compact heads that arise from a bract-covered floral base (receptacle), flowers tubular, radially symmetrical (disk flowers) to 0.2 cm long, crowded, flowers 14-25 per head, no rays, flower heads 0.2-0.4 cm tall, bracts dry, small, overlapping; inflorescence to 70 cm, usually branched, branches strongly ascending, July-Oct. Origin: Vermont and northward or northern Midwest, or native to this region and rare. Habitat: Dry, open, sandy soil or fill, in our region, usually a back dune plant. Notes: Taxonomy apparently not clear.